After separation from its booster, the Canadian Arrow cabin is oriented to provide the best window view for the passengers in this artist's interpretation. Two former rocketeerrivals are teaming up to develop privately-built spacecraft, officials withboth groups said Friday. Canada'sLondon, Ontario-based firm PlanetSpaceand the Romanian aerospace company ARCA - both past competitors in the $10 million AnsariX Prize contest for suborbital spaceflight - are pooling their expertise ora joint space project. While somedetails of the partnership remain under wraps, the collaboration will likely includethe sharing of technology and other resources, PlanetSpace officials said. "We bothhave capabilities to bring to each other," PlanetSpace president and CEO GeoffSheerin told SPACE.com. "It's a good fit to test out some concepts andideas." Sheerinentered the Ansari X Prize with plans for a V2 rocket-derived, reusable manned spacecraftdubbed the CanadianArrow. ARCA - short for Aeronautics and Cosmonautics Romanian Association -also cast its Orizont vehicle in the manned suborbital contest with plans for areusable rocket engine built from composite materials. Mojave,California-based aerospace and aviation veteran Burt Rutan's SpaceShipOnevehicle wonthe $10 million prize in October 2004. "By joiningforces with one of the leaders in private space exploration, we are certainthat we will succeed in creating a reliable and efficient technology, as wellas other exciting spaceflight projects," said ARCA president Dumitru Popescu ina statement. Since theend of the X Prize, Sheerin, ARCA leaders and other former competitors have continuedto pursue their goal of offering private flights into suborbital space. Under PlanetSpace,Sheerin and business partner Chirinjeev Kathuria have settledon a military base near Canada's Cape Rich along the Georgian Bay as theinitial launch site for their vehicle. They hope to conduct the first mannedtest flights of the vehicle by 2007, though plans to test fire a hybrid rocket engineand escape tower have been delayed pending the completion of an environmentalstudy, they said. "I thinkyou're going to see more groups coming to work together," Kathuria said of thecooperative effort. "It will give us a significant advantage." The Rm. 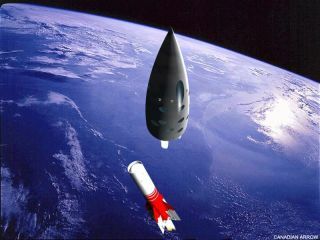 Valcea, Romania-based ARCA also announced Fridaythat construction is underway for its new suborbital spacecraft Stabilo. The vehicleis derived from the firm's hydrogen peroxide-powered Demonstrator 2B rocket,which launched successfully in a Sept. 9, 2004 test from an Air Force launchsite at Midia Cape on the shore of the Black Sea, they added. Builtprimary from composite materials, Stabilo's airframe is about 80 percentcomplete and should launch on its maiden flight - an automated trip more than62 miles (100 kilometers) above Earth - within the next 12 months, according toARCA officials. Fuel tanktests for the vehicle are slated for January 2006, with engine tests to followin March, they added. ARCA has alsosecured a contract with the Romanian Space Agency's Research Ministry todevelop a rocket system to be used for military applications. DubbedSTRACAAT, the unmanned rocket is slated to simulate airborne targets flying athigh altitudes and low altitudes. The rocket is expected to stand 19 feet (sixmeters) high and weight 881 pounds (400 kilograms) at launch, the company said. "It's a lotof work that they did," Sheerin said of the ARCA team. "Together we can do someextraordinary things."